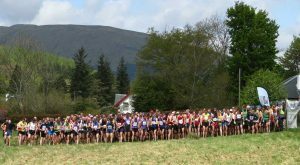 The Stuc a’Chroin 5000 Hill Race, first run in 1988, will be 29 years of age on Saturday the 4th May 2017. It is a race organised under British Athletic Rules and classed as a long hill race. Judging by the pallor of a lot of the runners at the summit, not to be undertaken lightly and is probably one of the most arduous races in Britain, even for experienced fell and hill runners. The race is unique amongst long hill races in that the whole route is marked by a loyal band of volunteers who go out on the hill and flag the route in its entirety. It is also the only hill race in Britain not organised by a hill or fell running club - organised by our community for the benefit of runners from all over Scotland, England and beyond. The race was last a British Championship Event in 2009. A total turnout of 324 runners started the race and 317 completed. 83 Clubs participated along with 31 unaffiliated runners. In 2013, it was a Scottish Athletics Championship event. The race attracts sponsorship from The Green Welly Stop, Kingshouse Travel, Thomas Allan & Son, Sula Furnishings and Pete Bland Sports (British Championship Sponsors). Last year we said goodbye to an old friend of this race. Archie Bennie retired as Secretary of the Race Committee after nearly 22 years. Although sad to leave the committee, Archie believes it's time to hand over to someone younger. Many thanks for all your hard work, Archie. After a couple of years without a responsible secretary, nothing has changed with the appointment of Steve Respinger as the new secretary. Ronie Hamilton, another old hand on the Committee, retired in 2008 as Chairman after 22 years. Graham Courtney takes over. I'm convinced Ronie looks younger since he resigned. Ronie, thanks for your work. Over its long history a few locals have completed it, including George Coppock, Pete Miller, Rory Brown, Wendy Halliday, Blair Falconer, Duncan Francis, Herbie McLean, Dentist Alistair Johnston and Doctor Kerry Mathewson, and current locals Dougie Aithchison, and Prasad. Strangely, not many came back a second time, though Prasadand Elke have won it three times between them.